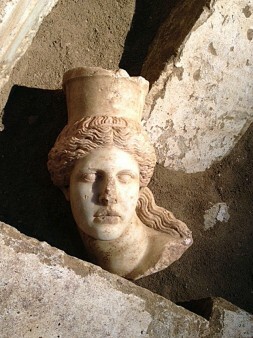 Academics discussed Amphipolis for the first time in a scientific conference. New discussions and disputes regarding chronology, a new find (from the Amphipolis necropoleis’ extended area that surrounds the monumental building’s peribolos) allegedly depicting Alexander carrying the weapons of his heroicized friend Hephaistion and traces of cremation within sediments and embankments leading to (following analysis) a mid 3rd- to 4th c. BC date for the monument. This is what the Amphipolis excavation team talked about during the first ever official presentation of their finds in a venue ethically acceptable enough for such a subject: the Aristotle University of Thessaloniki and the annual scientific conference on archaeological work in Macedonia and Thrace (AEMTH). For the first time since 2013 and the beginning of public reporting of preliminary data from the dig in Amphipolis, Katerina Peristeri, head of the much debated excavation project, spoke in the framework of this conference, receiving questions and comments from her fellow archaeologists. Hundreds of archaeologists and members of the public with an interest in the subject flocked the historical AUTH School of Philosophy Ceremonial Hall (when Manolis Andronikos had presented his Vergina finds in November 1978). The Amphipolis finds were the subject of nine presentations which monopolized the public interest, as well as the conference schedule, since their duration was finally much longer than expected. During her presentation, Katerina Peristeri repeated what she had mentioned last September (during an AUTH Alumni gathering) regarding the monument’s Thasian marble-made funerary peribolos, the Amphipolis Lion’s position on the tumulus’ top, the pebbled floor, the Sphinxes and their characteristics. She also presented a series of 4th c. BC monuments and architectural elements as morphologically and aesthetically similar to the Amphipolis monument, in order to support her proposed 4th c. BC dating. Among those “parallels” were floors from Pella and Caryatids at Bulgaria’s Svestari. Also, Ms. Peristeri referred to the skeletal remains found within the monument (representing a woman, a man, a child, and a cremated individual), pottery finds (spoons, black glazed vessels, pointed amphoras), coins depicting Cassandrus and Alaxander III and monograms representing Antigonus Gonatas. Following Ms. Peristeri, the project’s architect Michalis Lefantzis repeated the team’s suggestions by ‘deciphering’ fragmentary surviving mason’s inscriptions found a few km. to the S of Amphipolis: “Me, Antigonus, received building material in order to raise a monument honoring Hephaistion…” ; the large-size, c. 25 cm.-high, inscriptions bearing the “signature” ANT, known from the Antigonides in general, are here referring to Antigonus the One-Eyed (323-318 BC), and bear the word «ΠΑΡΕΛΑΒΟΝ» (received) as well as the letter-complex read as «ΗΦΑΙΣΤΙΩΝΟΣ» (“of Hephaistion”). A new find was presented by Italian archaeologist Antonio Corso. It consists of several marble fragments of a frieze coming from the Lion’s dais, found 120 m. far from the tumulus’ peribolos, within a site with hundreds of burials. A fragment bears a relief representation of a warrior wearing a helmet and holding a shield and a huge spear, while a horse’s head, a snake and part of a tree are also visible. The surviving relief fragment is now 1,60 m. high, while is thought it once reached 2,70 m. According to Corso, the warrior’s representation can be identified with Alexander the Great ( due to his hairstyle and posture) bearing the oversized armor of his friend and fellow fighter Hephaistion, now a deceased hero. Corso’ s suggestions, as well as part of the views expressed by Peristeri and her fellow researchers were highly questioned (or met with requests for additional explanation) by other archaeologists and academic community members consisting part of the audience. “This is a typical representation of a warrior and ‘heroic reliefs’ “, “this was a child-warrior and this is why he is so short in height in relation to the weapons he carries”. “The inscriptions have been carved prior to the final configuration (of the site)”. “The Amphipolis masonry had been formed in two chronological phases”. “The peribolos is later than the monument”. These are only a number of the questions/suggestions expressed by archaeologists/ Aristotle University lecturers. “We now participate in a section of the AEMTH Conference, not in an Amphipolis-related symposium” said the section’ moderator Maria Lilibaki-Akamati, forced to interfere.